Everyone’s favorite marsupial is in the process of getting enhanced, entranced, and ready to dance in HD graphical glory when he bursts back onto the scene in the Crash Bandicoot N. Sane Trilogy. But don’t worry, because the process isn’t that painful for him. Well, it’s not anything that a couple of wumpa fruits won’t fix. We know Crash has plenty of fans out there, all eager for news about when he’s going to spin things up again. Your patience has paid off! Activision and the development team at Vicarious Visions have been hard at work updating this classic trilogy, and they have some big news to share with you — as well as answers to some questions they’ve received from fans — so read on! My favorite level to work on was Future Frenzy. This level was jam packed with lights, signs, and all of these cool futuristic shapes. It was really fun making the city look alive, with all of the neon signs and the flashing lights. Getting the reflections on the buildings to look just right was a lot of work for the engineering team, but I’m really excited with how it turned out. This is a AAA remaster. We’re giving this the love and attention to detail that we pay to all of our AAA games. We’re building it using the original level geometry so that it plays as close to the original as possible. We’ve also referred to this as a remaster plus, as we are adding new features that we think the fans are going to love! We actually do check online now and then, and we read all our letters. But honestly we’re really, really busy. Did you notice that date? It’s coming up very soon. Like you, we are really huge Crash fans, and we feel that we are taking very good care of what we know is precious to you. There is so much to explain, and we will, in time. For now, please know that we love you, and that we love and appreciate your kind words and support. PSN digital Pre-order confirmed. Thank you Sony and Activision. Can’t wait to play through these again with a beautiful new paint job! That’s not up to vicarious visions, that is up to Sony and Activision’s legal teams. I’ve had the psone version installed for some time, tho I’m in the Eu, so not sure if that matters. LOL shoddy work? Did you play their cancelled Black Ops II port? Tell me more about how shoddy it was. What PRECISELY was wrong with it? It was shoddy enough that instead of seeing the project through, Activision felt it would be better for a shovelware studio to slap together something in six months. I play all 3 ps1 games plus CTR on my Vita for ears now. Ive used my ps3 to transfer them over to the Vita. @gerneric123 you are ridiculous. They don’t owe us anything. And in case you didn’t know, all three crashes work on vita. I have all 3 on mine and I have a US account. They work flawlessly. However due to legal reasons they are not available for US customers for what ever reason between Sony and Activision. I have them because they were accidentally made available during a store update about 2 years ago. So the US customers that downloaded them at that time and didn’t delete them still have the games on vita. You claim my comment is entirely irrelevant, yet you posted a “solution” that was active for about 72 hours two years ago? How is that relevant? Yeah, no duh the games can technically run on Vita. I never doubted that. All PSone and PSP games can technically run on Vita. I want them to actually run on Vita for everyone. If Sony and Activision can release the games for PS4, and the games are downloadable on Vita everywhere outside of North America, I don’t think this is an insane request. I also want Crash 1, 2, 3, & CTR (and Spyro 1, 2, 3) available on NA PSVITA STORE. I own all of them. It’s literally been forever, Vita is 5 years old now, this is a total disrespect to us fans and loyal customers. Please hear out requests and make them available on the NA PS VITA store. Could we perhaps get a demo at some point? #5: I’d like to know this as well. I’m sure it will be 3. I hope we’re gonna get Stormy Ascent in this remaster, even as an unlockable bonus or something. That would really put the icing on the cake. I also would like a demo if possible, to tide over till June 30th. If it’s possible, maybe if this is successful enough, how about remaking the first 3 Spyro games? And I’m wondering where Crash will go after this collection? Will there be a NaughtyDog splash screen or nod in this collection. Two days after my 31st birthday. Happy birthday to me !!! PS4 Pro support? Supersampling on a 1080p screen? I refuse to believe nobody asked about crash team racing. seriously if it’s not announced as a pre order bonus or something, I’ll pass. Why would you want CTR locked behind the Pre-Order pay wall? Maybe if this sells well, we’ll get CTR, Crash Bash and NitroCart remastered too. Nobody asked because we are content on what is coming and would like a moment to enjoy this collection instead of greedily asking for more. But, is it worldwide release date??? Could we get a demo? It would be nostalgic++ to have a Jungle Rollers level demo, like the original demo one…. I love the term “AAA remaster.” Sounds like everything I could have wanted. I’m really excited for Crash’s return, and for the chance to share these games with my daughter! I hope she likes them, Crash is one of my favs! Fan Freaking Tastic. First 6 months are locked in for exclusives for Sony now. I’m pretty sure if I’m not mistaken. Next up, who gets July? Maybe we’ll find out between now and E3. Nice, are there any plan to make special edition, if it isn’t I will buy the digital version. Wait, I thought ACTIVISION and VICARIOUS VISIONS said they got the ORIGINAL Voice cast back? NONE of these people are from the original cast. 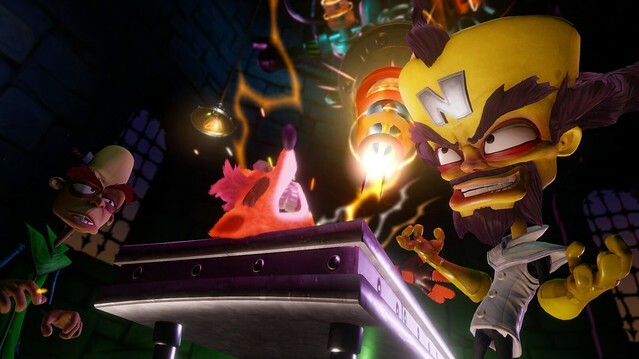 – Clancy Brown Voiced Doctor Cortex & Uka Uka from Crash 1 – Crash Nitro Kart before being replaced. – Mel Winkler voiced Aku Aku until Radical Entertainment”s trilogy. – Michael Ensign originally voiced N. Trophy in Crash Bandicoot 3 WARPED, CTR: Crash Team Racing, Nitro Kart & Twinsanity. Cory Burton did ONE game, and that was Wrath of Cortex. Which was awful might I add. – Brenden O’Brian voiced Dr. N. Gin, Dr. Nitrus Brio and Tiny the Tiger. Perhaps I’m being a little too nit-picky here, but when I heard ORIGINAL voice cast, I EXPECTED ORIGINAL VOICE ACTORS, the last game that had most of the original cast was Crash Nitro Kart/ Crash Twinsanity, and even though there were some definite changes to the cast, it was fine. And I could get over most of these changes except for one: Aku Aku. Mel Winkler did a fantastic job portraying Aku Aku as a fatherly figure to Crash, Coco and eventually Crush. However with Greg Eagles, all I ever heard was Grim from Grim Adventures of Billy and Mandy. Oh well, I already pre-ordered the game, might as well enjoy it. Ahem… Clancy didn’t voice Crash 1. I was hoping that you would remaster CTR as well. Maybe a free DLC down the road? This is an automatic Day 1. Especially when it’s priced at $40. If you guys remaster Crash Team Racing or Crash Bash that will also be Day 1s as well. We want spyro trilogy remake next!!! I have this pre-ordered on Amazon because I never owned any Playstation before I got PS3 and people have lot of positive things to say about the pre-Uncharted Naughty Dog games. FINALLY! I was never able to play the trilogy as this is my first PlayStation! I cannot wait! I preordered this for download and it says that it won’t be available until 12/31/17. So what’s the deal?? Is it available in June? Do I have to wait until December because I preordered it? cant wait!!! I really hope at least on the Pro this game runs at native 1080p (SSAA) and 60fps especially given that its not as demanding as Ratchet & Clank. Are you guys targeting 60fps? The return of a great PlayStation icon! Glad that I won’t have to wait that long before it comes out. So we can get a remaster of crash, but not of SOCOM? SOCOM has nothing to do with Activision and besides, Sony has closed Zipper Interactive. These where my first ps1 game’s and im really excited to share it with my little girls now. Spyro remake too please? If the Crash Bandicoot AAA remaster does well, do you think you could jump into a AAA remaster on the original Spyro trilogy? Are you thinking about remastering other games? I would suggest Crash Team Racing (best gamer ever!). That would be a great game yo play online. I have a question I pre-ordered Crash Bandicoot n sane trilogy on 1/23/2017 and at the time of purchasing it was going to come out at the end of the year (12/31/2017) which I fully expected. But now the release date is set earlier in June of this year. So my question is would I get the game at the end of the year or in June? Tell me there will be a ps vita port please!!! Does this have HDR? It will be a sham for me if it doesn’t especially with the boasting of colorful environments and neon flashing lights. I hope you will find it in your heart to bring us a PS2-to-PS4 port of Crash Twinsanity sometime this year to celebrate the release of this highly anticipated remastered trilogy. On behalf of many Crash Bandicoot fans, we would all love to see another Crash Bandicoot favorite brought to the PS4 with trophy support to add onto the classic trilogy in our trophy collections. The Wrath of Cortex would also be accepted, but we would definitely love to see Twinsanity on PS4. Thank you. Can’t wait! Been telling my kid’s all about how I used to love playing this game. Will you remake a CTR with multiplay online mode,iz would ne great od you do soue.